In the mid-90s, Ayse Birsel fell in love. She was working on a project and met another designer, based in Paris. His name is Bibi Seck and their love for each other inspired him to move to NY and build a business with Ayse. In quick succession, they had two children. Along with Bibi’s son, they were a family of 5, with a new business, a new city for Bibi and a relatively new relationship. Then the bottom fell out. The recession hit and seemingly over night, all their clients took their accounts in-house. With no work coming in and the pressures of raising a young family, Ayse Birsel, who had worked with some of the world’s biggest brands, found herself stumped. Then one day, a friend suggested Ayse analyze not so much who to work with but how she works. Her design process is a unique one and who knew what understanding it could garner. From this, Design the Life You Love was born. It’s a book that takes design principles and processes and uses them to better understand the life we have and the life we want. Design is a way of seeing and thinking. Moving it beyond objects and into our actual day to day is very powerful and here Ayse shares how she came to write the book and what it takes to design the life you want. Listen here to our conversation with Ayse Birsel or subscribe to the podcast through iTunes. Take the conversation with you and keep Design In Mind. 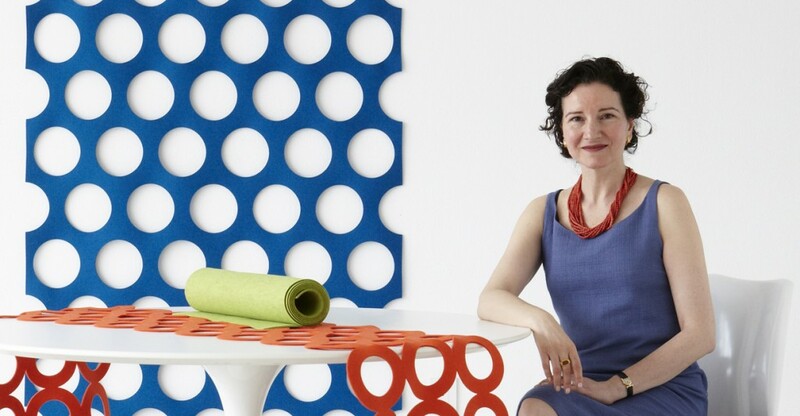 Below is a transcription of the Design In Mind interview with Ayse Birsel. Bibi and I started working together and having a family together. We were very busy, and we decided to work together. We thought it was so romantic. We joked about putting all our eggs in one basket. Because I met him through work, I felt very comfortable doing that, and he moved from Paris to New York. In a very quick succession, we had like two kids plus Bibi’s stepson. We were all living in New York, and had our office together. It was literally overnight like it happened just within a few days? It felt like overnight, and I probably didn’t see the signs because I had always designed, I had clients, and we were just so busy, and we thought, “Oh, we’re above the economy,” like very optimistic design. You had big clients like Herman Miller. Yeah, big clients. Herman Miller, Hewlett-Packard, and Target. A lot of good people that we’ve been working with for a long time. So we thought nothing is going to happen to us, but then boom. I can see their point of view as well. It was like we were an outside firm. It was easy for them to just cross us out at least for that time being, but then I couldn’t find a job and new clients, and I felt very responsible for Bibi for uprooting him from his comfortable life in Paris, and I tried with all my might, and nothing came about. It’s that time that was the beginning of everything else. That was like a lifeline. I took that very seriously, and I decided that I’m going to think about exactly that. So I went into myself deep down and tried to articulate this very intuitive magical process of like, “So, how do I create, and how do I think differently?” I mapped it out, I sketched it, and I wrote about it until I had what I ended up calling, “Deconstruction: Reconstruction.” That was the beginning of a change. It’s interesting. I think the creative mind is such a unique mind, and that’s why I’m so fascinated by it. Creative people look at the world so differently. I can only imagine how hard it must be to try and figure out how your mind works. Those first steps of really looking at yourself from the outside and saying, “How does my mind work? How do I think of things?” Was it really clear to you? Then, I could also see that how I was doing that in my product design work, but then that’s like the backbone of the work like the backbone of the idea, but then there’s a whole process of expressing it. You might say, “Well, I need to make something simple, but then how do you find a simple form? How do you find a simple idea?” That became the fourth step. Yeah. I think when we think about design and thinking about that in an object sense like let’s take this penholder right here. There’s one right here on this table. It’s obviously been designed. Maybe not designed well, but it’s been designed, and all the thoughts that they went through, “Well, how high should it be? Should it be as high as standard pens, or should it be a little bit higher? Maybe if we make it transparent, we can see the different color of pens.” You think about all those different steps, but when you actually think about that in regards to your own personal life, that’s where I think something really radical happens. Yeah, yeah. Let’s start with the whole process. The book itself is … it’s not a book that you do read, but it’s very interactive. Yes, and illustrative. Being a designer, my language is drawing. Even though that took me three years to realize that just because I was writing a book didn’t mean that it had to be all words, that I could actually draw it. If you see it, you’re not intimidated by the idea of design. Actually, there is … you need no prior design or creative experience. It’s really … if you’re interested in designing your life, you can pick it up, and the book will lead you from one step to the other to think about your life with optimism. To me, that’s what’s … what’s interesting about design meets life is that it gives you a process to think about your life creatively and with optimism. Optimism because we think that as designers, we could solve any problem no matter how complex, and that kind of optimism or positive thinking I think fuels our passion, and we love challenges, and nothing like your life as a challenge, design challenge. When you say the word “design,” what does that mean? It’s a hard one to define. It’s a hard one to define. I guess to me, design is coherence, and it’s about finding coherence between values and actions, and so I find that this is true in life as in product design. If you can figure out how to make an idea coherent within the constraints, within the values of the designer, the environment, the maker or manufacturer, the user, and … it leads you to simplicity beyond the complexity of the problem, and then you know it when it emerges. I think that what emerges, it’s like an elegant solution that’s coherence. That’s how I think about it now. So when you put life in there, then maybe the ultimate result will actually be simplicity because although in the midst of the process, it seems so complex, particularly when you’re deconstructing and reconstructing, there’s so many different parts. I was thinking about, “Well, what parts do I include of my life? Like how detailed do I get?” because you can get really detailed when you think about all the things that you love or that take part in your every day. Really, the final result is to simplify it. Yes, and to visualize that simplicity because I think like in any design project, if you can visualize a solution, you’re so much closer to making it happen, and so I’m trying to show people that if they can visualize the life that they imagine, they’re so much closer to making it happen, and then that idea often excites people. When you’re excited, then you find the energy to think about, “Well, what do I need to do to make this happen? How do I bring other people along, bring in collaborators?” and you really start working on it. I found that when my life really gets out of whack, I lose my coherence, and I start questioning everything that I’m doing, and I forget why I was doing what I was doing. Actually, when I started designing my life and became my first student, that was probably the biggest benefit from the process was reconnecting with my values, and then reconnecting my values to what I was doing and taking comfort in the fact that they matched. I realized that sometimes you almost need to remind yourself of those things, and once they matched, then I could imagine the future, and so that became the foundation of, in a way, simplifying my life. Values is really the key? It’s the core? Values is the key. Yes. I learned so much about design through this process of teaching design to mostly non-designers around the idea of life. I knew this, but it really made me realize that values are what sustain us through any kind of design. What are our values? It’s like it could be simplicity, it could be honesty, it could be grit, but imagine, once you know those, then things fall into place, and you try to bring those values forth in your life. One of my favorite exercises in the book is about getting people to think about their values, but in a roundabout way because I realized that if I ask myself or anybody else what your values are, it’s like a super hard question. How would you answer that? When I was thinking about it, initially, family … I was thinking about it in those terms, about my family, my immediate family, which is my husband, my daughter, and then my … the family I was born into, which is my mom, my grandma, my father, and then creativity and connection is my biggest value. But then, you were saying you were using different kinds of words like “grit” or like “adventure,” and so it’s very … it is a really hard question. It is a very hard question. How do we do that in design? We go look for and gather inspiration. We don’t know the solution, but through the inspiration, we gather and connect with the values that we want to capture and how we see that in other kinds of work. Inspiration is really the key to connecting with your values. If you’re designing your life, where does inspiration come from? It comes from other people. Who do you admire, or who are you interested in or that you find … inspires you or has qualities that you want to have in yourself, you want to emulate? The point is these are not superheroes. They’re ordinary people, and maybe you know them personally. Maybe you know of them. They could be artists. They could be scientists, writers. Then, you capture their qualities. I don’t want to give the whole thing away, but that leads to your values. Once you have your values, that becomes the foundation, the foundation of your design. I’m not going to say it either, but I thought that part was particularly interesting. We’ll keep it mysterious, mysterious. Let’s start with the Deconstruction: Reconstruction because that happens to be part of this book, and it happens to be part of your design practice. Yes, but Tania, may I take you to step zero? What comes before deconstruction is warming up your right brain, so there is a little drawing exercise. I actually wanted to do that with you today because you’re so beautiful, and I want to draw you. The drawing exercise is … one, it’s very meditative, so it gets you into the flow, but it’s also like a way to tell your right brain, “Wake up.” Plus, a lot of people who are interested in designing their lives are not designers, so I want to very quickly get over that barrier. A lot of people tell me, “I can’t draw.” I’ve been doing these workshops for five years. I learned that everybody can draw, and it doesn’t matter. It could be stick figures, but you really need that other brain, so you need to be able to write and draw. That’s step zero, but then, deconstruction, which is my favorite way to get into a project and not be afraid of the white page is taking something apart. If your project is life, if you take your life apart, it’s like, “What are the basic building blocks?” In the book, I give a couple examples, so that you can see. You don’t have to invent it yourself. The basic blocks are, like you were saying, family, work, friends, how you spend your time, location. After that, it becomes very personal because we’re all different than how you fill up family, friends, work, and then within those things, how do you break things apart? The trick to doing it is just going with your gut basically. If I tell you, “Apple,” what comes to your mind? What comes to your mind? Apple. For some reason, I thought about the apple on a stick with caramel and nuts, which I’ve never eaten in my life. That’s very unique. Okay. I haven’t heard that before. All right. I don’t know why, and it was random. Really. Very cool. Okay, but that, right? So, that? That’s the speed at which you do deconstruction. You go with like what comes to your mind, and without judging because I said, “Apple,” you said, “Apple candy.” I’m not judging that. The same way with deconstruction, you just put things down. That’s one kind of deconstruction. Do you want to hear the second kind of deconstruction? Of course. I love this! It’s exciting! I’ll tell you everything I know. There is a second deconstruction. The first deconstruction is like, “Oh, let me take my life and look at the building blocks, and then take those building blocks apart.” What I’ve learned over time is that most people’s lives fit on two pages, which is an incredible relief. It’s like that complex project. You really like … you can open your sketchbook, and it will be contained in those two pages. Then, I ask people to do the second kind of deconstruction, and that’s thinking about your life in four quadrants, emotion, physical, intellect, and spirit. That really is about the holistic side of design, how to think about any subject 360, like the big picture. I just want to ask specifically around the four quadrants. Let’s say in the emotion area, what would be examples of what could be in there? Yes. The emotion is really whatever goes through your heart, and you could make a sentence and say, “I feel. I feel love. I feel joy. I feel safe,” but this is also the place where you could note the things that are hard or difficult, “I feel confused,” or, “I dislike.” Deconstruction is a great place to talk about everything. That’s why you’re going with your gut, and some of those things are positive. Some of those things are negative. Some of them are ambivalent. Some of them are about the past, and some are hopes and maybe things you don’t have in your life, but would like to have. It’s like that bucket. Then, imagine you deconstructed in four quadrants. The reconstruction is … again, you can do it in four quadrants, but you only get three choices in each quadrant, and that is for the convergence of design. You have to make choices, and so you say, “Okay. I have three emotions to choose in emotion, three in intellect, three in spirit, and three in physical.” That really helps you focus like just like you’re saying, what matters in my life. What ties the two together, the deconstruction and reconstruction, is the point of view. That’s where you discover your values and start to imagine your life, the life you love. But then, reconstruction and you’re making choices. It’s all about what you put in versus what you leave out. I find that that’s incredibly powerful to see your life in 12 circles basically and say, “Okay.” That becomes like a roadmap, and that doesn’t have to be forever, but for a certain amount of time, that’s your roadmap, and I love the simplicity of that. You take these four quadrants, you fill them up as much as you can, then you pick the three that are most important to you, and then those … that becomes the roadmap for your life for like the next five years at least. Or the next one year. I’ve done this. It’s funny because when I was trying to finish the book, I did a reconstruction map with only three circles. It was Christmas holiday and the kids were on vacation. I had three weeks, and I did three circles, and I said, “Okay. In these three weeks, there’s going to be the book, kids and Bibi, and good food,” and that really … I was like, “Okay. That’s all I’m going to concentrate on,” and I was successful. I finished the book, I hung out with my kids, and we ate good food. It could also be … you can be very playful and say, “Okay. I’m going on vacation. What’s my design for my vacation?” The other thing is it’s just on paper, right? You can do it, and then you can redo it. There’s something to be said. All studies show that when you write things down, the potential for them to come to fruition increases exponentially. When you draw them out too. Yeah, when you draw them out. Yeah. Write/draw. Exactly. I love how you summarized that, and I’m going to use that. That is it. Did you notice you were asking “what if” questions? Point of view shifting is all about “what if” questions. “Today, this is like this, but what if I did that, and what if I did this? Like what if I lived in New York and San Francisco? What if I lived in San Francisco, but I tapped into the talent in New York?” It’s all those questions and generating lots of ideas. No, are there? No way. I love that about the metaphor. One, it’s very visual, but it gives you all these hooks to then think, “Well, what does that mean for my life?” Before you know it, people are like imagining their life and really imagining with a lot of detail and information, and they themselves are surprised at what they discover. In your previous … I shouldn’t say “previous incarnation” because you’re still … I’m sure you’re still designing objects. Yes. Yes, but you’re right. The new Ayse. Yeah, it is. Right. It is a pretty big shift. To my point of view. Yeah. It’s so different because on the one hand, when you create products, they go out into the world, and you know that they are being received well, but you don’t actually see how they’re changing people’s lives. Tania, I was joking about this. I love design because you have the hope that you will positively impact people’s lives, and I’ve designed many things from toilet seats to office systems to pens to kitchen gadgets. Cars, but nobody ever stopped me on the street and said, “Your potato peeler changed my life,” but I can tell that ever since I started doing Design the Life You Love, people do stop me. They don’t stop me, but I’ll run into them on the street or they’ll send me an email, and they will say, “Ayse, your workshop has changed my life,” and that … there’s nothing like that, to feel like I have a purpose. It’s the foundation of happiness actually from … If you look at the studies and happiness is a state that goes in and out, but is the foundation of a fulfilled life is to really be … to be helping people, and supporting people, and doing good in people’s lives. You have such a tangible way of saying because you’re doing workshops with people, and you’re seeing them change over even hours. You see them come in with one point of view on their life and what’s important to them, and then it evolves into something else. That must be so exciting. “Do workshop,” I said, “Yes,” and just attended. It’s like there are some stories on The Moth about people saying yes, and now I’m like, “I agree with them.” That’s what I would tell my kids to say yes. When you were initially doing this for yourself, what things did you discover about yourself that you didn’t know? I love that question. I can point to two things. One was my metaphor for my life. The first time I did it was a tree, and I still maintain that. The tree was because I wanted a metaphor that could explain the fact that I grew up in Turkey, and so those were my roots, but then I had been living in New York, and I thought, “Well, that’s my trunk. That’s my present,” and so my roots make me strong, and that’s my culture, but then my trunk is about growth and getting stronger, and that’s about my process, my creativity. But then, I was like, “Okay. Well, if I’m a tree, what’s my future?” Because I had set it up as like Turkey, New York, first, I had to figure out the location, and so I thought, “Well, Turkey, New York. The next should be the world,” so I went for the big picture, but I realized, “If I’m a tree, like I need to have fruit, and have seeds, and become a forest.” That helped me realize, “Yes, I do need to write a book. I do need to do workshops. I need to share what I know.” When I was talking about coherence, that helped me build coherence between the now and the future, and I took ownership of doing more to share my expertise, so that’s one. Again, that was another coherence of like, “Yes, I was an introvert, but for what I’m trying to do, I can also be an extrovert.” I was like, “I can be both,” and that helped me make peace with myself that I wasn’t being somebody who I was not. You know what I mean? Mm-hmm (affirmative). I know exactly what you mean. Now, I’m an extrovert, and then when I go home, I can … actually, when you’re a mom, you can’t be an introvert. It’s the end of introvert. Yeah, but you can have your quiet moments in your internal moments.